Gov. Tony Evers’ biennial budget proposal for 2019-21 puts a big emphasis on education. As the former Superintendent of the state Department of Public Instruction (DPI), it’s a natural fit. As we wrote last week, the new governor’s budget would spend at least $1.5 billion more on K-12 schools. How much would he spend on higher education? That’s what we’ll break down today. 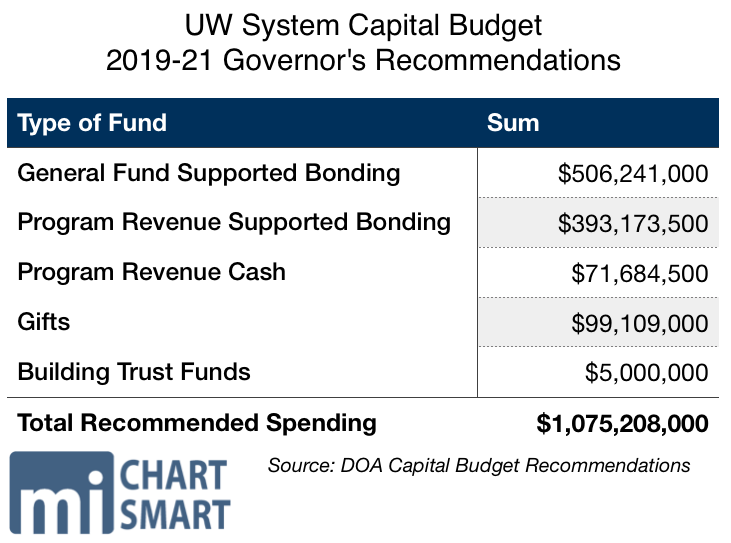 Overall, the plan proposes $175 million more for the UW System across the biennium, for a total of $12.76 billion, all funds. That’s a 2.8 percent increase from current spending. 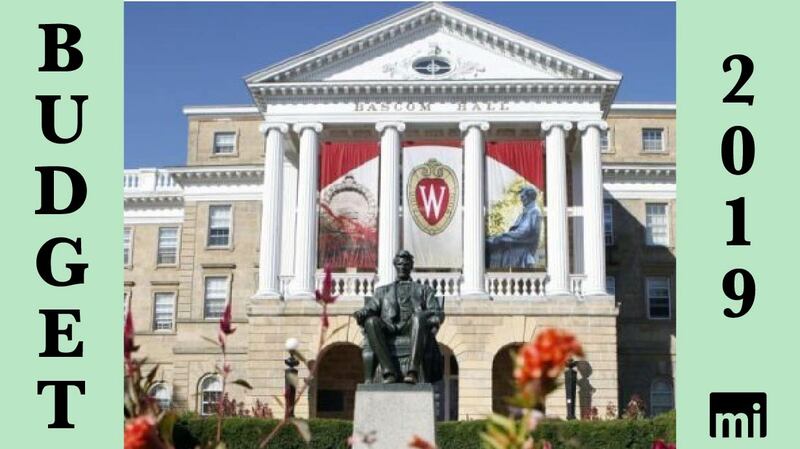 Total positions at the UW would increase by 240.84 full-time equivalents, a 0.67 percent increase. The 36,293.16 positions at the UW will make up half of all state-funded jobs. Across Evers’ entire budget plan, positions would increase by 701 full-time equivalents. Just over one-third of those new jobs will be at the UW System. Looking at only general purpose revenue (GPR), the largest fund of state tax dollars, spending at UW will increase by $69 million under Evers’ plan. 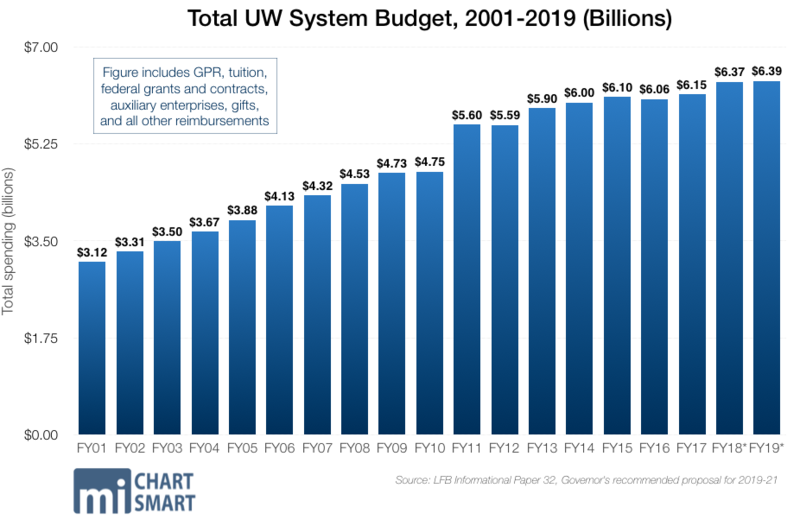 That’s a 6.2 percent increase, bringing total GPR spending at UW to $2.36 billion across the biennium. The cornerstone of Evers’ budget plan for colleges and universities is a continuation of former Gov. Scott Walker’s tuition freeze for in-state undergraduate students across the University of Wisconsin System. That move has saved students and families thousands of dollars in college tuition and loan costs since the freeze began in 2013. Continuing the tuition freeze is one of the most taxpayer-friendly initiatives in the entire budget proposal. The governor deserves kudos for continuing the popular measure. In the years before the freeze, tuition had steadily increased year after year. 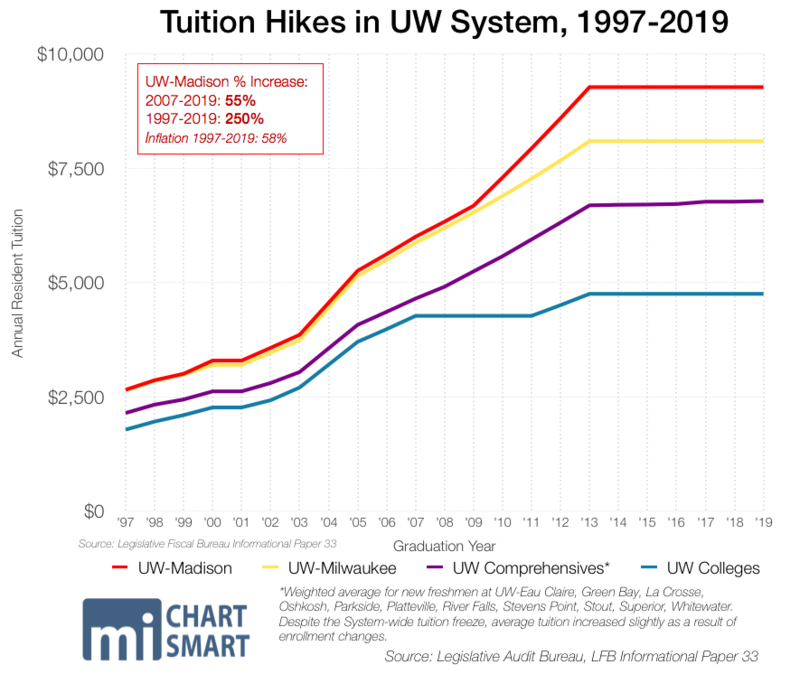 At UW-Madison, for example, resident undergraduate tuition jumped from $6,678 in 2008-09 to $9,273 in 2012-13, a 39 percent increase in actual dollars. Student loan debt has exploded in recent years, and one good way to control those costs is by limiting their growth in the first place. For even more of an impact, the administration should consider implementing more pathways for three-year degrees, as Walker had proposed in the last budget. That sounds a lot like the UW’s slush fund of hefty program revenue balances, a pot of money that legislators in the state’s CPA caucus discovered in 2013. 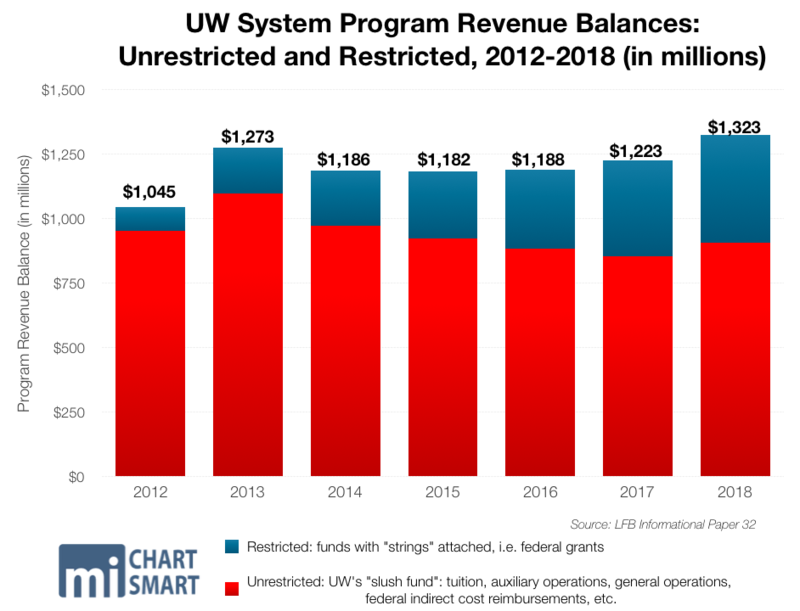 The slush fund totaled over $1 billion, leading lawmakers to question why the UW continued raising tuition and asking for more funds when they had tucked away such sizable surplus balances. The slush fund became the main impetus behind Walker’s tuition freeze and other program cuts. The system is now required to regularly report those figures and justify any large increases. Since 2013, the System’s Program Revenue (PR) balances have continued to grow. At the close of the 2018 fiscal year, total PR balances for the system stood at $1.3 billion, an 11.6 percent increase from 2014. However, funds have shifted to the restricted fund away from the unrestricted fund. The restricted fund is made up mostly of gifts, funds, and contracts. The largest portion of the unrestricted fund is tuition, followed by auxiliary operations. Nearly twice as much money is in the restricted fund today compared to 2014 ($417 million now, vs. $212 million then.) In 2014, 82 percent of all PR balances were unrestricted. Today, 69 percent are unrestricted. 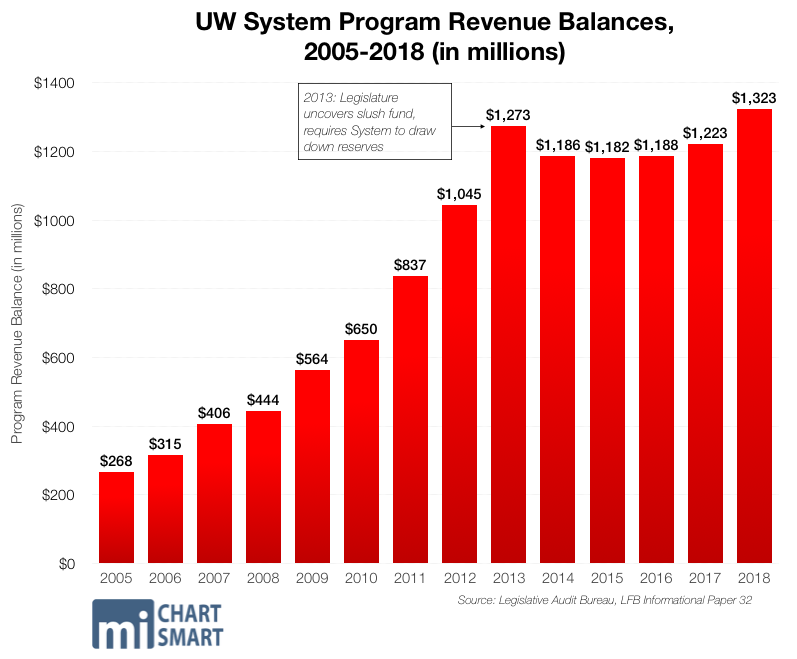 With such hefty balances, it’s important to ask why the UW System will see a sizable $175 million increase in the biennium – and whether that increase is truly justified. Alongside the tuition freeze, Walker’s last UW System budget had prioritized performance-based funding. Those measures create goals for the institutions, like graduation rates or job attainment. UW schools then receive more or less from a portion of state dollars based on their performance on the metrics. While the system had requested $82.5 million more for performance-based funding, instead, the money goes to other Evers priorities. The move effectively wipes away an initiative which has only just begun. While the tech college system has operated under performance-based metrics for years, the UW System has had just two years to implement the plan. Without letting the system have much time to work out the kinks of the process, Evers’ plan takes away the very opportunity. The priorities to which Evers redirects the money include $45 million in GPR for building initiatives, $26.3 million GPR for faculty pay increases, $50.4 million for the tuition freeze, $4 million for supporting student services at UW Colleges, $10 million for nurse educators, and $2.5 million for county-based representatives through the UW-Extension. Compared to Evers’ plan for K-12 schools, this approach sets larger amounts of money to fewer individual projects. The proposal puts $17.3 million into need-based Wisconsin grants. Students could use that grant at any UW System institution, tech college, private nonprofit universities, or tribal colleges. The Technical College System also receives $18 million in each year of the budget, a 7 percent annual increase. One controversial measure extends in-state tuition to undocumented Wisconsin residents in the UW System and the Wisconsin Technical College System. Those individuals must have graduated from a Wisconsin high school, have a high school equivalency degree, and have continuously lived in Wisconsin for three years after beginning high school. They must show proof of having filed for a visa or proof that they will file as soon as they are eligible. In all, Evers’ proposal spends $5.9 million more at UW than the agency itself had requested. Tipping his hat to the Democratic Caucus, Evers sets up a committee to study the creation of a state-run refinancing authority. Wisconsin Democrats have long pushed for their “higher ed, lower debt” package, which includes a government-run refinancing authority specific to the student loan industry. Walker had long resisted setting up such an authority, arguing that private business already allows students to refinance their loans. He’s right. UW Credit Union (UWCU) has expanded membership eligibility multiple times in recent years. Individuals can now become UWCU members if they’re a Wisconsin resident who attended any accredited university nationwide. Today, students who aren’t even Wisconsin residents can refinance their debt through UWCU. They simply need some connection to the state, like being an immediate relative of a UWCU member. Under Evers’ plan, the study committee is tasked with forming a plan by late 2020 for inclusion in the 2021-23 budget. Large portions of the plan for the UW System weren’t included within the biennial budget. That’s because the state’s facilities are funded in the capital budget, released shortly after Evers’ original budget proposal . Read our initial coverage on the capital budget here. 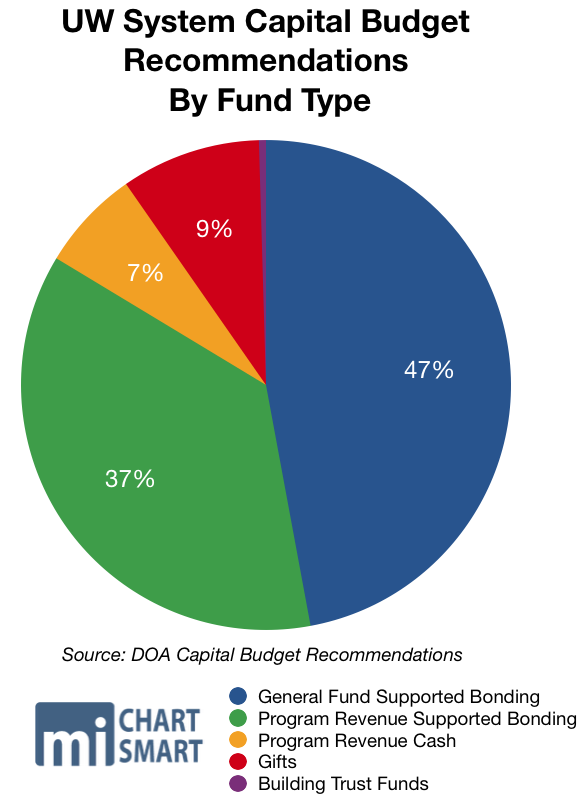 The capital budget would increase state bonding to $2.5 billion, more than double the previous budget. New bonding approaches nearly $2 billion. Of that, approximately half would go to the UW System. Evers’ capital budget recommends spending $1.1 billion on building projects across the system. The vast majority – $899 million – would be borrowed. Charitable gifts account for $99 million of spending, $71.6 million is cash, and $5 million is building trust funds. Renovations are spread across the state. Numerous initiatives, like classroom renovations and general utility improvements, are system-wide. Others, such as a chemistry building at UW-Milwaukee for $129.5 million, or $83 million for a science center at UW-La Crosse are specific to each campus. Milwaukee’s proposed chemistry building is the most expensive single project for UW included in the governor’s plan. All of that project is funded by borrowing. Not counting system-wide measures, about $401 million would go to UW-Madison for building projects. That includes funds from all sources, including gifts. 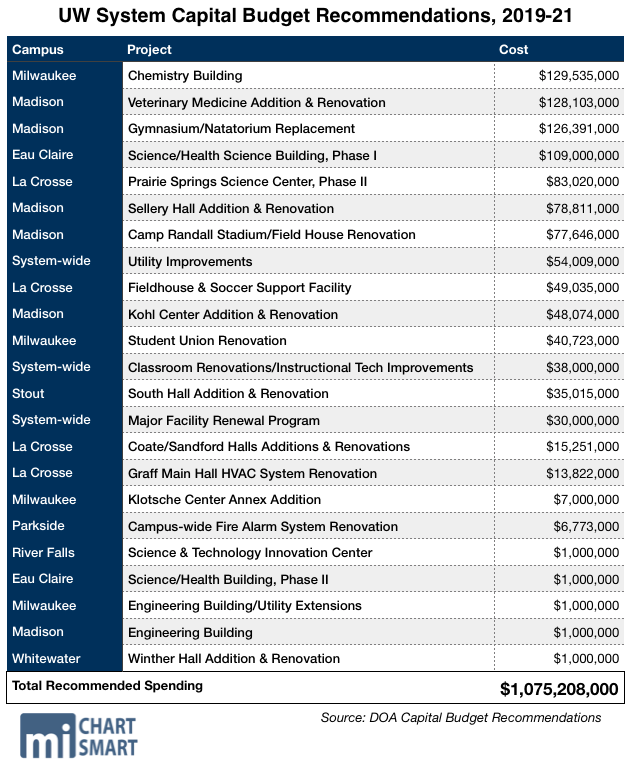 UW-Milwaukee would see over $178 million for projects. The governor’s capital budget turned down millions of dollars worth of proposals from the UW System alone. The system had requested $1.9 billion in spending, including $1.7 billion in borrowing. Evers’ recommendation drops those figures by nearly half. Budget work will continue in earnest when the Legislative Fiscal Bureau has completed its work on a nonpartisan fiscal analysis, expected later this month. After that, the Joint Finance Committee will hear from each agency, before traveling around the state to hear from the public. As always, MacIver will be there every step of the way.